Wings of Prey is the gorgeous new World War II PC flight-simulation title from Moscow based developer Gaijin Entertainment and is based around large-scale, historical aerial combat and land-based military operations of World War II. Players can participate in some of the war's most famous battles piloting fighters, attack planes and bombers across a wide range of thrilling missions. There are six theatres of war to engage in - The Battle of Britain, Stalingrad, Ardennes, Berlin, Sicily and Korsun representing the main airborne battles of World War II in Europe. Built upon the original code base for IL-2 Sturmovik: Birds of Prey for console game systems, Gaijin has gone to work and added unique features and content only available for PC flyers! Wings of Prey on the PC, contains several new missions, aircraft and cockpits not found on the console. In total there are over 40 aircraft to fly and fight against in over 50 missions in 6 different historical aerial campaigns. And if you need practice, there are training missions and a mission generator that allows you to create your own custom aerial matchups to hone your dogfighting skills. There is also proper support for joysticks, throttles, rudder pedals and head tracking devices such as the TrackIR. Wings of Prey also boasts an all new damage effects engine as well as advanced environmental visuals enriching the game play. Wings of Prey features hundreds of airplanes taking part in large-scale air battles. The unique environmental engine also produces highly detailed, realistic landscapes that allow players to see breathtaking ground support actions. The terrain engine in Wings of Prey generates some of the most beautiful scenery ever found in a flight-sim on any platform. From the cliffs of Dover, overlooking the English Channel, to the bombed out Berlin skyline, to the frozen forests of the Ardennes, the landscape is truly amazing! The intense aerial combat is ultra smooth as the code has been heavily optimized to ensure good frame-rates on a wide variety of PCs. 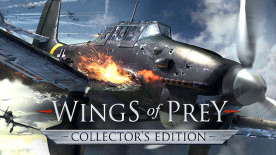 This Collector’s Edition includes both Wings of Prey and Wings of Luftwaffe.